Most people finance their vehicle purchases because few can purchase their vehicles cash. However, many people don’t know a great deal about the finance process. We here at HGreg.com want to help you be better prepared for the financing process before you set foot on the dealership lot. With pre-approved financing, you will enjoy similar benefits as if you were paying by cash or check. 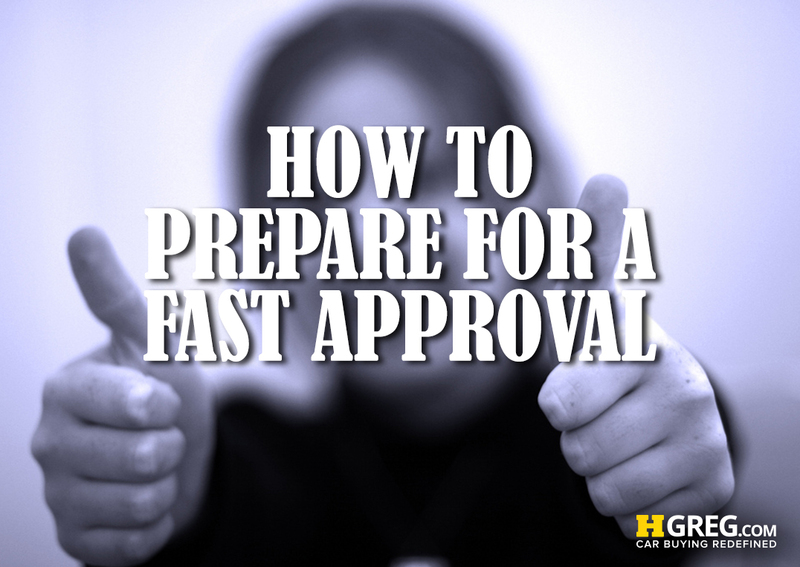 The following steps are to help you prepare for a fast approval. Make sure your credit report is accurate. According to the Federal Trade Commission (FTC), 26% of consumers have at least one error on their credit reports, and 5% have errors that lead them to either be denied credit or pay higher rates of interest on financial products like auto loans. For this reason, it is important to request your credit report, check it for errors, and dispute any errors you find. The FTC has found that in about 50% of cases, this leads to an increase in one’s credit score. Make sure you meet minimum auto lending requirements. Most banks, credit unions, and other lenders that pre-approve borrowers for financing require a minimum monthly pre-tax income of $1500, as well as a debt-to-income ratio (DTI) of 45% or less. You may not be able to boost your income in the short term, but you can improve your DTI by paying off your debts. Bring your proof of income to the dealership. Most lenders require you to submit a current pay stub – no more than 30 days old and showing year-to-date salary totals. In most cases, they will want you to be a full-time W2 employee. Self-employed borrowers will need to provide at least 90 days of current bank deposit records and up to 5 year’s of tax returns. Make sure your driver’s license is valid. Although this should be obvious, many people don’t realize that they need a valid driver’s license in the state where they reside. Sometimes people have suspended licenses without even realizing it. You want to be sure that your driver’s license is up-to-date and valid. Make certain you have full coverage insurance. All reputable auto lenders now require consumers to carry a full coverage insurance policy on the financed vehicle. This ensures that the at least part of the loan balance will be recouped in the event of an at-fault accident that totals the vehicle. If you are considering buying a car, one of our finance officers can help you get started today.